Once you’ve taken a look at your budget, you’ll be able to easily see just how much you’re putting toward your debts, how much goes into savings and any extras you have. When looking for extra money in your budget be sure to pay attention to what you spend on the non-necessities of life. Things like daily coffee runs, alcohol, or takeout. Now that you have an idea of just where your funds are going, let’s look at debt vs. savings. If you yourself are struggling to get out of debt and haven’t yet heard about the Snowball Method, you can read my post all about how we paid off $6,000 in just 6 months! If you are totally unsure of where to start I highly recommend following Dave Ramsey’s 7 Baby Steps as laid out in Financial Peace University. Another great idea is to check your FICO credit score to see where you stand credit wise. You end up paying more the longer you have it. It takes money away from you every month. It can ruin your credit score. Prevents you from living the life you want. Prevents you from building a secure savings. Dave Ramsey insists you treat your debt like a gazelle running away from a cheetah. That means run fast; duck and weave, do whatever you have to do to pay off debt and pay it off as soon as possible! There are also so many ways and methods out there that you can implement when it comes to tackling debt. Check my tutorial on how we paid off $6,000 in 6 months using the Snowball Method. There is another method called the Debt Avalanche that is similar to the Snowball Method but instead of paying your smallest debts first, you pay off the ones with the biggest interest. How you choose to execute your debt payoff is up to you, but it is definitely going to require you getting a game plan in place. If you need a little extra guidance, I will give you some great steps to help you get started below. As I said before, Tom and I opted to join Dave Ramsey’s Financial Peace University and are so excited to be in the final stages of our debt payoff with only $10,000 left to go before tackling our mortgage! I have created a playlist on my YouTube channel where you can easily follow along on this journey with us to learn exactly what we’re doing and can see just how quickly we can make this thing happen! So, it’s pretty obvious to see, building a savings is far more beneficial to you than having debt. See 12 ways how you can save $1,000 fast. But, I’m sure you already knew that. This is why, despite the amounts of debt you might have, so many people continue working and striving to save money. It’s something we all need and definitely want for the future. Now, obviously, I don’t know your unique financial situation, but if you are really struggling to pay off debt, let’s talk about why you might do well to consider putting your savings on hold. According to Dave Ramsey’s Baby Steps, the first thing you should do before you pay off debt is build a $1,000 emergency fund. Once you have a $1,000 emergency fund in place, you should begin putting all of your financial focus toward paying off debt. See how you can get paid to have a savings account. Seriously throwing your money at debt while putting your savings on the back burner can just help dig you out of this situation that much sooner! Then you’ll have even more money to put into your savings! Check your budget. Do what you can to find or create that additional money that you are going to need to get started. Consider a loan to help consolidate debt or lower your interest rate. This can be especially helpful if you have a lot of debt on a credit card with a high interest rate. Apply online with The Loan Exchange. Save $1,000 Get your emergency fund in place so that you don’t have to stress about money troubles that might present themself. I recommend a high yield savings account so you have the potential to gain interest. Tackle debt. I strongly recommend using The Debt Snowball that Tom and I have been using. It works and is a very simple method. No matter what, just keep going. It will be discouraging at times but do your best to always look on the bright side. I promise normal people pay off huge amounts of debt every day and you can be one of them. It might mean some serious adjusting and changes. It will take discipline and determination, but you can totally do this! I get it, the idea of not saving can be really scary for people. So, what I say, is if you are absolutely too anxious about stopping your savings, then you should definitely look into opening a Savings Builder account with CIT Bank. For just $100 to open and $100 per mont, you can gain an interest of 2.45% with the Savings Builder account. Checkout the other perks. This was one of the biggest discussion we had with my.husband when we first married and we opted to paying off debt mostly for the reasons you mentioned. even though having money in saving provide some peace of mind, debt interests are dream killers i tell you. thanks for sharing. They really are, Denise! Even more important is being able to have those kinds of discussions which is awesome! I am currently working through paying down some major Student debt! It’s quite the burden and I want it paid off before I am 30! We have a lot to go, but we are working really hard at it! That is so great! It definitely takes dedication! You can do it! I’ve tried paying off my debt (no interest) before saving, but it’s just such a big amount that is so demotivating! Now I’m kinda doing both, which is not ideal…until I figure out what to do! My boyfriend made me an excel and it has really helped me see how much money I can pay off and save per month. That’s awesome you were able to find a happy medium! Great info! I love getting good financial insight. Thanks so much for sharing all of this info! My student loan debt is so overwhelming, but you’re right, it is only going to increase as time goes on! The cheetah reference is so true ha! So grateful for the tips! Paying off student loans was a great day! Good luck as you keep at it! I actually got my credit card debt sorted out with the help of a debt consolidation company. I spent years feeling unsure of how to resolve it, but thankfully when I went for I picked the right company and got it fixed. Now I have a good balance between saving and paying bills off. It’s a great feeling to have that kind of balance in my life. Thanks for sharing. I definitely want to build up my savings more before focusing on debt – which is just student loans right now. It’s good to know that’s the best way to go. Thats awesome that all you have it student loans!! Hooray! 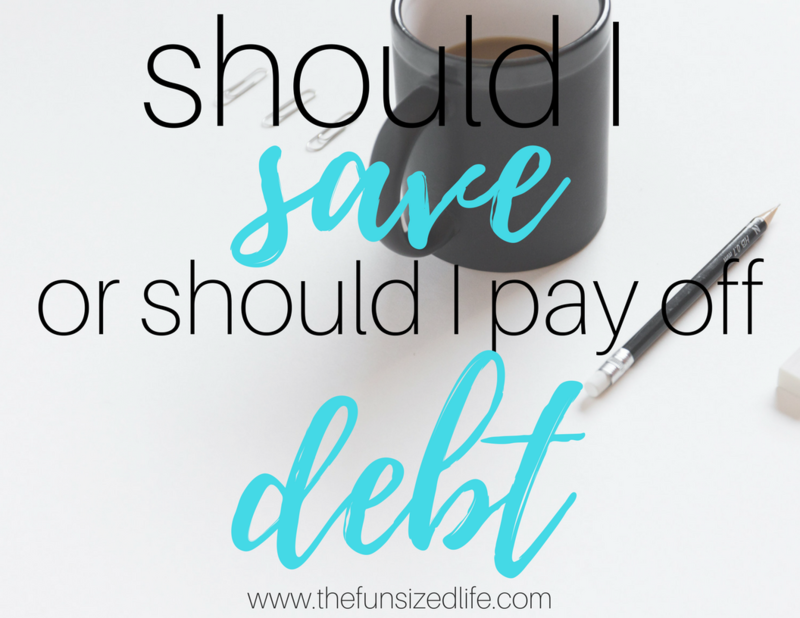 It really can be so hard to decide between paying off debt and saving money, this is something that my husband and I discuss a lot. I think Dave Ramsey definitely has some great advice on the subject, my husband and I really enjoy listening to his radio show and we’ve both read his book. Great post! I know what it’s like to pay off a large amount of debt. My husband and I paid off $70,000 of student loan dept with high interest rates in 2 1/2 years after we were married. It took so much hard work and sacrifice, but I’ve never regretted it. We now are able to save so much because we were so used to living off so little. Life is so much easier when you are dept free! That is so awesome!!! I’m really hoping for similar results for our family as well! I’ve also saved a bit of money (mostly for rainy days) while I have debt. Then sometimes I use that savings to pay off smaller debt. It’s all about finding what works. Gotta love those rainy days! This post is so helpful! I really appreciate how much you break everything down and make it seem much more manageable. Thank you! Gosh such a good question! We kinda did a little of both at the same time honestly. But we really tried to do the snowball effect and paid off my student loans so we could be debt free before my first was born! That is so great! I’m glad you found something that worked for you!